At Numi Lash & Brow we carry three different grade of lashes; cashmere, silk, and synthetic mink. 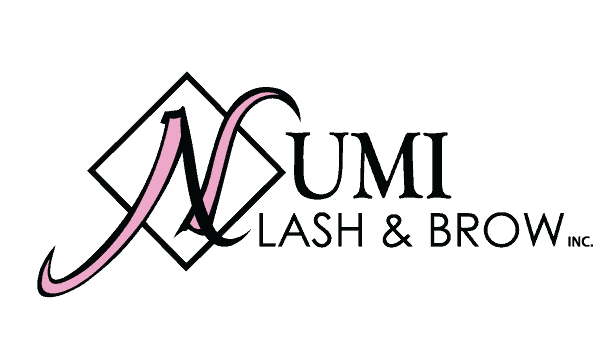 Our lashes come in different thickness, lengths, and curl. Refills are recommended around every 2-3 weeks for classic and 3-4 weeks for volume lashes. To qualify for a refill, your lash extensions should still have a 40-50% retention. 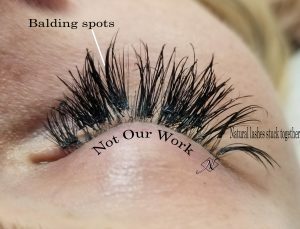 At your refill appointment, if your lash extensions are less than 40% left, your lash technician will only be able to fill what is possible in the given appointment time. To maintain the same fullness as a new set, come in for your fill more frequent. During the process, only very grown out lash extensions will be removed, new lashes will be put in. Lash extensions are applied only to your one natural lash at a time, never touching your skin. There is a safe distance between your lash extensions and your skin. If the lash glue is on your skin it may cause irritations ( dry skin and itchiness). There’s only a small amount of glue dipped onto the lashes, therefore glue would never drip into your eyes. After 1 week, your lash extensions is growing out a little along with your natural lashes. This is after 4 weeks of growth. Some lashes will grow faster than others, this all depends on your natural lash cycle. This is the reason why we recommend coming in for a refill sooner. For classic lashes, it is best to come in between 2-3 weeks and volume lashes at 3-4 weeks. 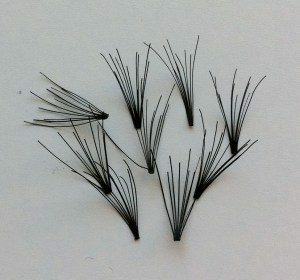 When lashes are outgrown, they can bend or turn because of the weight. Lashes then get messy and tangle up, this can sometimes cause damage to your natural lashes because of the pulling weight. No, if lashes are applied properly, it will not damage your natural lashes. By following the recommended aftercare, lash lengths and density, one can wear lashes for a very long time. Yes, if lashes are applied improperly, it can cause damages to the natural lashes. By applying an excessive amount of glue or not isolating properly, may put too much weight on natural lashes. As a result, this can cause the lashes to fall off faster. Improper at-home care is also a big contributor to damaging natural lashes. 1. Not cleaning your lashes properly and regularly, causing a build-up of products and dirt, blocking hair follicles. Over time your lashes will get dandruff and bacteria causing your lashes to shed before its cycle. 2. Playing, picking, over brushing, rubbing your lashes, sleeping on your lashes(sleeping on the side or face) all of these will cause your lashes to get pulled out from its roots. 3. Wearing waterproof makeup products, glittery makeup, mascara and eyeliner all contribute to damaging your lashes. All of these products are hard to remove from the extension base. Mascara and eyeliners can stick on to your lashes like sticky gum. Some customers still have junks of makeup on their lashes after 3 days of not wearing any makeup. Trying to clean it all out can be too rough on your lashes causing it to be pulled out, but not cleaning it can cause dirt and bacteria built up. Lash crimps pulling our lashes!! Bottom lash mascara, every time you blink they go onto the top lids. Mascara buildup from two days!! Lashes after removal, thinner and some bald spots!! Volume lashes not properly fanned! Unfortunately clustered lashes are used by a lot lash technicians to perform permanent eyelash extensions. What are clustered lashes? They are thick pre-glued lashes or chunks of volume lashes that are not properly fanned. Why are they bad for natural lashes? They are bad because they are super heavy for natural lashes to handle. With the pre-glue base, extra glue is added to attach to natural lashes. They also have a bigger base than Russian volume lashes, therefore they can easily attach to 2-5 natural lashes. When one or two natural lash falls out it pushes the other lashes to come out too. Huge chunks of un-fanned volume lashes are bad for your lashes too because they can easily pull more glue, making it harder to isolate natural lashes. They also don’t look as fluffy and natural, it makes your lashes look stiffer. Our technicians are professionally trained. Our lashes are hand fanned only every time, making it lighter and fluffier. We isolate all our lashes making them not sticking together as much as possible. Proper work takes time, therefore a new set of lash extensions takes around 2 hours and a refill takes around 1 hour. What is the difference between Russian volume lashes and volume lashes? In terms of appearance, they look similar. Russian volume lashes are self-made fanned and not pre-glued lashes. Volume lashes can be used for lashes that are pre-fanned and pre-glued. Russian volume has a better wear retention and is less heavy for natural lashes. Lashes are properly isolated and applied. 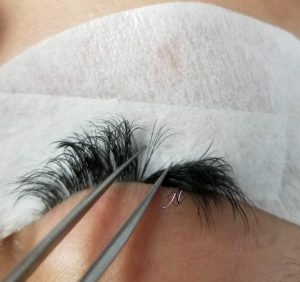 How to maintain eyelash extension at home? There are a few eyelash extensions style, cat-eyes, doll-eyes, natural eyes, and messy eyes. Natural eye: Lashes are longest around the eyebrow arch area. The inner corner of the eyes are where lashes are the shortest and outer corner are where its mid-lengths. Messy eyes/ Kim-K: This look is where short lashes and long lashes are randomly placed.